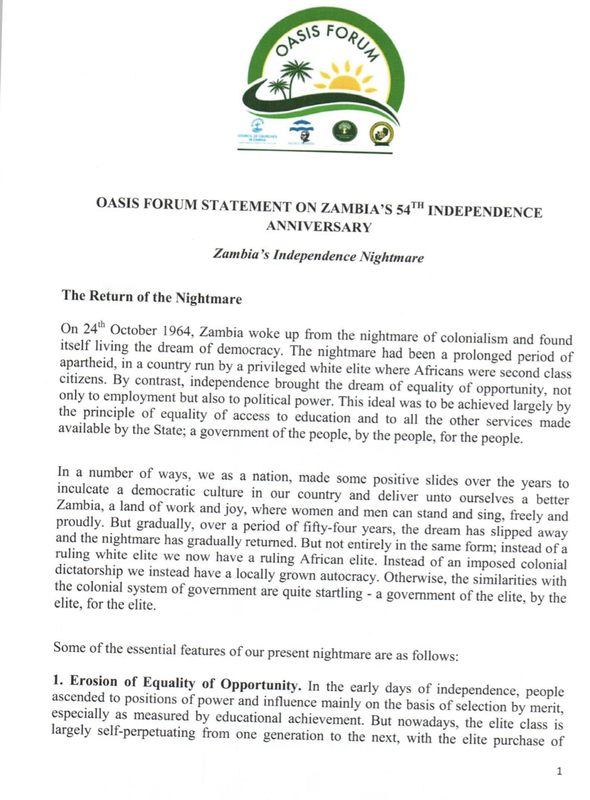 Lists 7 essential elements of the current Zambian nightmare. 1. Erosion of Equality of Opportunity. In the early days of independence, people ascended to positions of power and influence mainly on the basis of selection by merit, especially as measured by educational achievement. But nowadays, the elite class is largely self-perpetuating from one generation to the next, with the elite purchase of expensive education, and with the intra-elite selection for employment and promotion. Elite class membership now supersedes educational level. 2. Lack of Separation of Powers can especially be seen between the Executive and Parliament, where the ruling party typically has an overwhelming majority so that Parliament becomes a rubber stamp for Executive decisions, and has virtually abdicated its primary role of holding power to account. Whereas the Mung’omba Constitutional Review Commission and the Technical Committee on the Drafting of the Zambian Constitution established that people wanted a separation of powers by having ministers appointed from outside parliament, parliament itself quashed this popular demand as part of its wholesale ‘amending’ of the Draft Constitution in 2016. 3. The Current Debt Burden has seriously eroded our economic and political independence, and even eaten away our sovereignty. With the conditions attached to donor funding and loans, donors and creditors have achieved influence over investment priorities, over government policies, and over foreign immigration. In some cases foreign creditors are even able to demand the transfer of national assets to foreign companies in lieu of unpaid debts. The thirty (30) percent of the budget now going to debt servicing has drastically reduced government expenditure on education, health and social services, with poverty levels now sinking to colonial levels. 5. The Development of a Police State has greatly contributed to the unconstitutional powers assumed by a dictatorial type governance. The police service, which is supposed to be a professional institution guided by the constitution and the law, is instead found to be taking instructions from the government and even directly from the ruling party. This is in large part due to the infiltration of this once-professional body by party cadres. 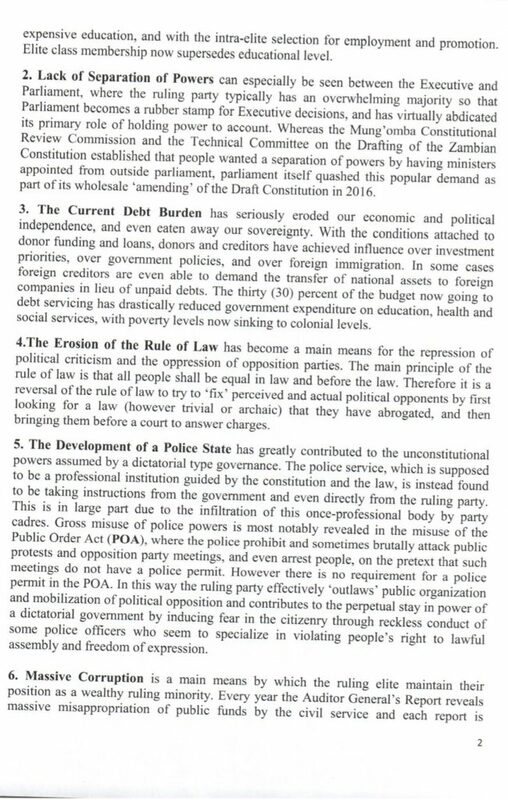 Gross misuse of police powers is most notably revealed in the misuse of the Public Order Act (POA), where the police prohibit and sometimes brutally attack public protests and opposition party meetings, and even arrest people, on the pretext that such meetings do not have a police permit. However there is no requirement for a police permit in the POA. In this way the ruling party effectively ‘outlaws’ public organization and mobilization of political opposition and contributes to the perpetual stay in power of a dictatorial government by inducing fear in the citizenry through reckless conduct of some police officers who seem to specialize in violating people’s right to lawful assembly and freedom of expression. 6. 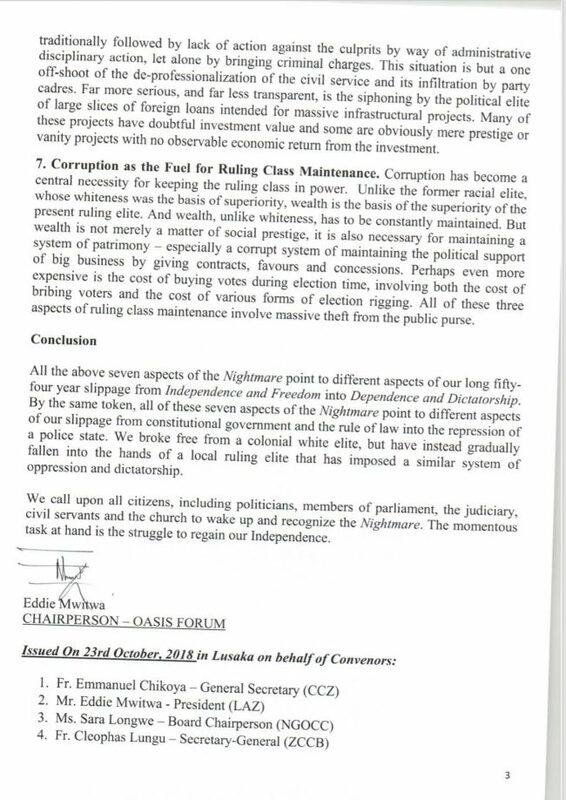 Massive Corruption is a main means by which the ruling elite maintain their position as a wealthy ruling minority. Every year the Auditor General’s Report reveals massive misappropriation of public funds by the civil service and each report is traditionally followed by lack of action against the culprits by way of administrative disciplinary action, let alone by bringing criminal charges. This situation is but a one off-shoot of the de-professionalization of the civil service and its infiltration by party cadres. Far more serious, and far less transparent, is the siphoning by the political elite of large slices of foreign loans intended for massive infrastructural projects. Many of these projects have doubtful investment value and some are obviously mere prestige or vanity projects with no observable economic return from the investment. 7. Corruption as the Fuel for Ruling Class Maintenance. Corruption has become a central necessity for keeping the ruling class in power. Unlike the former racial elite, whose whiteness was the basis of superiority, wealth is the basis of the superiority of the present ruling elite. And wealth, unlike whiteness, has to be constantly maintained. But wealth is not merely a matter of social prestige, it is also necessary for maintaining a system of patrimony – especially a corrupt system of maintaining the political support of big business by giving contracts, favours and concessions. Perhaps even more expensive is the cost of buying votes during election time, involving both the cost of bribing voters and the cost of various forms of election rigging. All of these three aspects of ruling class maintenance involve massive theft from the public purse.